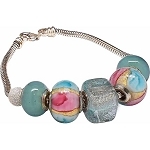 Cool amethyst Murano glass beads are the focal point of this PERLAVITA bangle bracelet. In the center our exclusive line of Dichroic Silver Shimmers in a brilliant amethyst dicrhoic cube flanked by matching beads. Complete with sterling clips to keep the beads in place. Add more beads or change the look all together by unscrewing the end off the bangle and sliding on more beads.